Portsmouth beat Manchester City in their first game since the dismissal of Tony Adams to end a nine-game winless streak in the Premier League. Glen Johnson opened the scoring in the second half, drilling the ball into the top corner after Shay Given had parried his first effort. Hermann Hreidarsson doubled their advantage with a brilliant header. David James amazingly denied Ched Evans as he made a record-breaking 536th Premier League appearance. City only showed occasional glimpses of the type of football they can produce and manager Mark Hughes cut a frustrated figure as he watched from the touchline. A vital three points - has the curse of Tony Adams been lifted? But the result is a superb start for Pompey caretaker boss Paul Hart as his team picked up three valuable points in their battle against relegation. Portsmouth had not won in the league under former boss Adams since they defeated Blackburn 3-2 on 30 November and had not registered a clean sheet in the top-flight since their goalless draw at West Ham on 15 November. The match was the weekend's only Premier League fixture and the result lifts Pompey above Tottenham and level on points with Newcastle and Bolton. 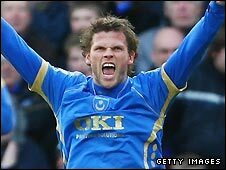 Pompey fully deserved their win after showing the greater ambition and desire. A purposeful run from the returning Jermaine Pennant led to the first opening of the fixture. The ball ran fortuitously to Peter Crouch after Pennant was tackled but the tall striker's firm shot on the turn flew straight at Given from 12 yards. A deft ball over the top from Niko Kranjcar sent Nugent through. The in-form striker cut in from the left and closed in on goal but he could not quite shake off the attention of several City defenders and was forced wide, with his eventual shot missing the target. City struggled to retain possession but their first sight of goal fell to Elano, with the Brazilian, back in the side in place of the suspended Shaun Wright-Phillips, drilling his effort over from 20 yards. Brian Kidd, brought in as assistant to Hart, was an animated figure on the touchline, and Pompey continued to show the greater endeavour, with Given fractionally beating Nugent to the ball after a long ball up field from Johnson. Nugent, with three goals in his previous four starts, was a lively presence but he should have done better with a header after Johnson picked him out with a cross from the right. The chances continued to fall to Nugent after the break, with the striker again springing the offside trap but failing to hit the target with his strike across goal. City showed the occasional glimpse of skill and flair - one deft backheel from Elano particularly catching the eye - but it was Pompey who looked the most likely to score and Crouch shot wide from a tight angle while Nugent missed with another header. Pompey's efforts were rewarded when Johnson scored his third goal of the season. He cut in brilliantly from the touchline and, after his first shot was parried, reacted quickly to regain possession and smash the ball into the roof of the net. Hreidarsson extended the home team's lead, while Johnson almost doubled his tally but his effort was saved. James, who moved past Gary Speed in terms of Premier League appearances, had a quiet record-breaking afternoon but made the most brilliantly athletic save to foil Evans. "At the moment clean sheets are the order of the day. 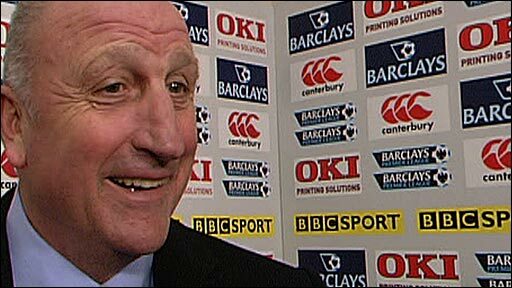 "I am really pleased for the club and the players, who worked their socks off and kept to the game plan. They were very disciplined. "There are good players here and on the back of results confidence grows and you see a lot more from the team." "It is a missed opportunity. 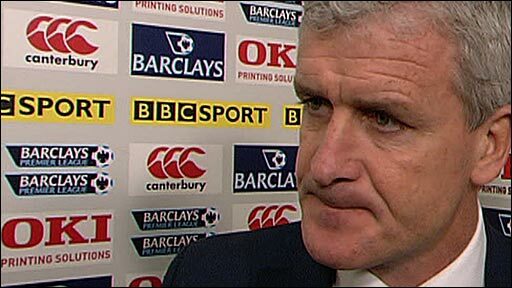 We were looking to get positive points, ideally three. "But you cannot win if you do not have the majority of your team playing well. "We did not really deserve anything from the match. We did not have a determination and a willingness to chase lost causes." Portsmouth: James, Johnson, Campbell, Distin, Hreidarsson, Pennant (Belhadj 86), Basinas (Mullins 67), Davis, Kranjcar, Crouch, Nugent. Subs Not Used: Begovic, Pamarot, Utaka, Kanu, Gekas. Goals: Johnson 70, Hreidarsson 75. Man City: Given, Logan, Kompany, Onuoha, Bridge, Zabaleta (Evans 78), De Jong, Ireland, Elano, Bellamy, Robinho (Caicedo 66). Subs Not Used: Hart, Garrido, Fernandes, Berti, Weiss. Booked: De Jong, Ireland, Bellamy. BBC Sport Player Rater man of the match: Portsmouth's Niko Kranjcar 6.60 (on 90 minutes).